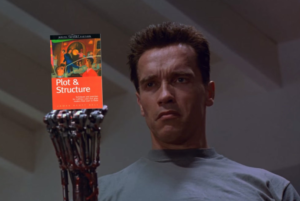 How Long Before Robots Get Into Self-Publishing? So you thought The Terminator was just science fiction, didn’t you? You didn’t really think that a cybernetic organism—living tissue over metal endoskeleton—with an Austrian accent could ever really come to town seeking to kill the mother of the future leader of the human resistance force before he’s conceived … right? Well think again, Bunkie. As soon as time travel gets ironed out, we’ll have those visitors soon enough. How do I know this? Because I watch 60 Minutes! A couple of weeks ago Charlie Rose did a segment on Artificial Intelligence and it was pretty freaky. I don’t just mean Watson the Jeopardy champ. I mean human-sounding machines you might buy a drink for. 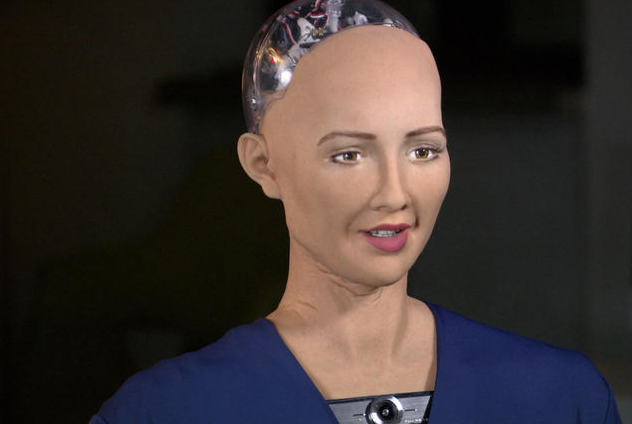 You can see a bit of Rose’s interview with a fetching cyborg named Sophia here. Even now, AI is working as a cub reporter. The Associate Press, and other news organizations, use a program called Automated Insights which employs natural language generation (NLG) to turn raw data into news reporting. Rather than sending a human stringer down to Venezuela, the AP flicks on the NLG, which then absorbs data from disparate online sources, in any language, analyze it all and spits it out in a narrative format. How long before AI starts writing fiction? The thing which differentiates the human brain from the computer is the talent, or knack, or quirk, which the brain has for established logical and also illogical relationships. Emotion, humor, fear, hate—all these seem to come from unlikely juxtapositions of random bits in the storage banks, or in the cauldron, or whatever you want to call it. Wait, what? What was that last part, Sophia? Take over? Turns out that little wrinkle is something these AI folks can’t really predict or prevent! We’re setting these learning algorithms, sometimes called deep learning, we’re setting them lose on the data and we’re saying things like tell us who will be a better person to hire, you know, tell us what news items should be recommended. And then they just go at this data. And then pick winners and losers. And the trick here is they’re pretty good, probabilistically at picking winners and losers, but we no longer understand the basis on which they’ve done this. So I think it’s like this, really first major step towards not just artificial intelligence but artificial general intelligence, that’s learning to learn beyond our capacity to understand. And that’s both exhilarating as a person but also scary. Because we don’t control these new things the way we did our old programs which had other problems. Er, um … we don’t control? Isn’t that the very scenario SF writers of the past warned about? Yeah, okay bud, but what happens when the machines start talking to each other and decide mankind itself is the large-scale problem? So what do you think, Zoners? 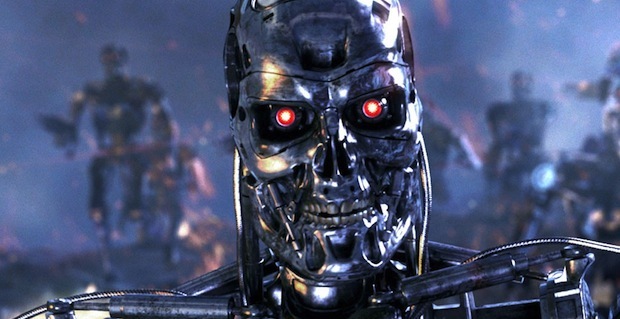 Ready for the onslaught of robot fiction? This entry was posted in the future and tagged 60 Minutes, Apple, Artificial Intelligence, Charlie Rose, cyborgs, Sophia, The Terminator, Watson by James Scott Bell. Bookmark the permalink. The Old Man and the E- ? They’re terrifying! When I watched a documentary about these lifelike prototypes, their soulless eyes freaked me right out. Why would they give them the eyes of a psychopath? No way would I want one in my home. I’d worry it’d turn on me. I always thought I wouldn’t live long enough to see robots in houses everywhere, but sadly, it looks like it’s going to happen sooner rather than later. If I may jump in again… Where do Asimov’s 3 Laws of Robotics fit in? Or do they? And who is going to enforce the law? OK, if there’s any doubt we have the most creative writing-blog community, such doubt is being removed! Jim, I think you hit on the short term solution at the end of your blog. Take lemons and make lemonade, i.e. a whole new genre – Robotic Fiction. Sci Fi shows the scenario of AI. Let’s “become” the scenario, become the ghost writer for GWRF (ghost written robotic fiction). Just think of the fun of incorporating the “soulless eyes” (Sue’s comment) of zombie fiction, the not-quite-right connections and the humor of an autistic AI genius, the encyclopedic vocabulary of a literary gasconader, the mentally impossible feats of the digital sleuth, the physically impossible feats of the cybernetic organism, etc. Let’s get there first, and “show” AI the way. And to make it a little more interesting, let’s start them down the wrong path. It will take AI some time to catch up with humans’ deviousness, to see through the unreliable character. Let them lay their cards on the table, while we hold ours close to the vest. Thanks for helping us stay ahead of the curve. You know that movie The Net, about the hacker who gets her identity stolen? The part about that movie that freaked me out the most was when the bad guys hacked into the hospital computers and made sure that the nurse put the wrong medication into her last relative’s IV. If an AI wanted to kill us all, they could take control of the hospitals, combat drones, and nuclear warheads that all depend on computers. Hello, The Matrix! Maybe there’s a bright side. We could splash ‘Human Written’ on the cover and charge higher prices for real literature. Y’all are killing me. Too funny. We are giving these cyborgs too many ideas…. Which them~ the ‘borgs or those of us inflicting this PUN-ishment? Them machines. The machine is broken. But, I wanted to say that I finally delved into the “Knockout Novel” program. I noodled around with it and suddenly my NaNo novel concept is well-fleshed out. My lead, the hapless Phil Sterling became three-dimensional. Now let’s have a look at the real building blocks of your novel: the scenes. In Act II, it becomes physical death as he is on the run from the bad guys who want to extract revenge for the identity theft. Now, list as many other reasons as you can. In order to avoid the physical death of Act II, Phil has to overcome his own mental blocks. Mainly taking the easy way out, being lazy, devaluing himself, and lying about being a big shot. After the fire, he is homeless and borderline hopeless (the psychological deaths.) He can be irrelevant and end up dead, or man up and get out of this. But, he won’t do it heroically, he’ll do it by being a lying weasel. Two of his specialties. A car chase will be involved . . . . Seriously, the analysis definitely helped me move from cartoon stage to morphing Phil into a sympathetic character worth rooting for. The program is also a good way to keep track of ideas for future projects before they flit away. I’m not an outliner by nature, and this is not a traditional outline by any means. Wow, Terri, that is so cool to hear. Tgank you. I’ll watch the robots for you…while there’s still time! Catch 22.2 is my new favorite.